Academician Yury Nikolaevich Molin is the outstanding scientist, world-wide recognized leader in the field of physical chemistry and chemical physics. Scientific name of Yu.Molin for its colleagues and disciples is closely related to the notion " school of thought". Yury Nikolaevich, as well as a number of other well-known scientists-academicians (Yu.Tsvetkov, V.Kazanskii, K.Zamaraev who have untimely died), were the disciples of academician V.V.Voevodskii. 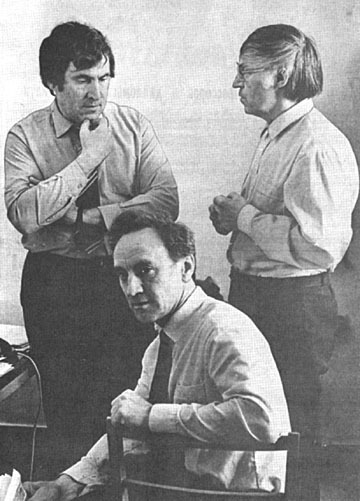 And Vladislav Vladislavovich Voyevodskii (1917-1967), in his turn, was one of the of the most bright disciples of the Nobel winner, academician N.Semenov. Being thirty seven year old, Yury Nikolaevich became the director of the Institute of chemical kinetics and combustion of the Siberian Branch of the Russian Academy of Science , having prepared the thesis for a doctor's degree, about hundred printed scientific works and having the authority of the great interesting scientist at the level of the Soviet Union and internationally. More than twenty years (1971-1993) he was the director of the Institute of chemical kinetics and combustion of the Siberian Branch of the Russian Academy of Science (ICKaC), and it has been just these years when the scientific subjects of ICKaC have formed. Presently he is the head of the laboratory of fast processes. In Siberia, a variety of the promising scientific directions developed to advantage in Russia and abroad is created under direction of Yu.N.Molina. Much of that was made by disciples of Yury Nikolaevich is linked to a word "first". When young, he was the creator of the first-ever setup for the EPR spectra of the free radicals to be observed under an electronic accelerator beam. The use of the setups similar to it is made up to now in many laboratories of the world for study of primary processes of radiolysis, determination of the relation between the structure of matter and its radiation stability. Yu.N.Molin with collaborators have formulated the first-ever conditions of selective control over the rates of the reactions of the free radicals with molecules in gas by means of irasers. Now the IR-laser photochemistry is a vigorously developing branch of science. Yu.N.Molin is " the father " of spin chemistry. It is the scientific field where the reactivity depends on the electron-nuclear interactions of partners (free and an ion-radicals). He initiated, and subsequently supervised the first works on the study of magnetic field effect on the rate of liquid-phase radical reactions. 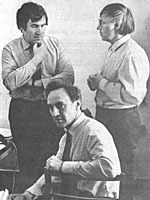 The formulation of the basic mechanisms of such an effect and their experimental verification became the subject of the discovery N 300, the author of which was recognized to be Yu.N.Molin with colleagues. Being guided by principles of spin chemistry, the scientist together with his disciples has offered a new procedure of optical detection of free radicals and an ion-radicals in solutions. An EPR spectrometer created based on this principle possesses the highest sensitivity available, and the procedure of optical detection of short-lived paramagnetic particles is included in an arsenal of leading laboratories in the world. 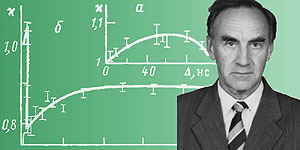 In 1986, a cycle of the researches " Magnetic and spin effects in chemical reactions " completed with the participation of Yu.N.Molin is awarded with the Lenin prize. The scientific school of academician Yu.N.Molin has got the support under the presidential program " The leading scientific schools of the RF". Yu.N.Molin successfully combines his fruitful scientific work with the pedagogical one. He headed sub-faculty of chemical physics in the Novosibirsk state university for many years. Under his supervising, 34 candidate dissertations are defended, 3 doctors of sciences are among his disciples. Yu.N.Molin's scientific merits are remarked by high awards. He is awarded with " October Revolution " order, " Labour red Banner ", " For the merits in the Motherland " of the IV degree. * Istochniki: 1) TSvyetkov YU. Odin iz pyervykh // Nauka v Sibiri. - 1994. - N 5-6. - S.2. 2) Lyeshina T. Vkus k postizhyeniyu novogo // Nauka v Sibiri. - 2004. - N 4. - S.2. Dokumyent izmyenyen: Wed Feb 27 14:46:40 2019. Razmyer: 10,404 bytes.